One mark on lid(shown in pic) Good condition all works. Looking to move on this MacBook Pro after upgrading. Runs very smoothly. MacOS Mojave. MacBook Pro. We can provide a fast UK dispatch. Our warehouse is situated in (Heathrow). Processor : Core i5. This Macbook is in perfect working condition. macOS 10.12, Sierra FREE TO UPGRADE. PRODUCT SPECIFICATIONS. Generally in good condition with scratches marks and dents as pictured. 2.8GHz Core i5. This macbook is part of a corporate upgrade program so is in good condition. I do not provide any further warranty or undertake repairs. The much more powerful i7 quad core processor has a turboboost mode, which reaches 3.3GHz when needed. This is the last user upgradable MacBook Pro, featuring all of the pro feautures that you would expect from Apple. Generally in good condition with scratches marks and dents as pictured. 2.5GHz Core i5. This macbook is part of a corporate upgrade program so is in good condition. In the event of a problem I will do my best to resolve it. 256 GB SSD - 16GB RAM - CORE i7 2.2 GHz. 2015 MODEL. MacBook has no scratches or marks on screen and keyboard. MacBook is not locked any iCloud account. C leaned and 100% fully functional and in full working order. 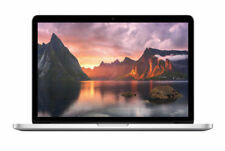 New listingApple Macbook Pro 13" Retina 2.9ghz 8GB 512GB SSD. Very good condition. This laptop has been well looked after and seldom used. it has been factory reset and ready to be set up by the new owner. the OS has been updated to to the latest Mojave. serial numbers have been recorded for seurity. • 512GB SSD. • 2.6GHz (turbo boost to 3.1GHz). The screen, lid and keyboard have a couple of small marks but are still in overall good condition. The bottom has a lot of scratches and scuff marks and is missing two rubber corners (see photos). 6 months warranty, buy with peace of mind, minor wear and tear hairline scraches and dings. Perfect working. Apple Macbook Pro A1278 2010 2.4ghz 240GB SSD 4GB RAM OS Sierra. FULLY WORKING TESTED Apple MacBook Pro A1278 13" Mid 2010 Laptop. Greatest ugrade to a machine possible. #U Keyboard. Macbook is in great condition with a few hariline scuff marks on the lid, base and aroudn the sides and for a 9 year old machine that is in remarkable condition. Apple MacBook Pro 2017 13 Inch Intel i5 2.3GHz 8GB 256GB Laptop - Silver. 5 out of 5 stars - Apple MacBook Pro 2017 13 Inch Intel i5 2.3GHz 8GB 256GB Laptop - Silver. 4 product ratings4 product ratings - Apple MacBook Pro 2017 13 Inch Intel i5 2.3GHz 8GB 256GB Laptop - Silver. 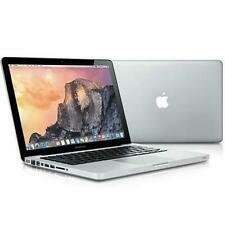 Apple MacBook Pro 17" 2.8GHz 500GB 8GB UK Vat Inc, . Condition is Seller refurbished. Item does not detect battery so charger has to stay in .Possible motherboard/battery issue. Thats why listing is so cheap. Top Spec -Hardly Used- Battery Cycle Count of just 219! Model:MacBook Pro. Inside case. Few marks of fading from previous case, but otherwise in perfectly working condition. Upper case. Condition is Used. In good condition with slight signs of wear and tear! The screen has wear from overwiping but in use it’s not noticeable because the brightness of the screen shines through it. Im here to help. 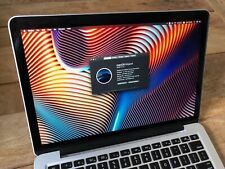 New listingApple Macbook pro 2015 A1502 excellent condition! Excellent condition no scratches or marks anywhere. Full specs are shown on one of the pics. Recent desktop upgrade forces sale. 5 out of 5 stars - Apple Macbook pro 2015 A1502 excellent condition! 28 product ratings28 product ratings - Apple Macbook pro 2015 A1502 excellent condition! This MacBook is in great condition. Very light marks on the base plate, not really visible on the photos. Fully working and reset with the latest Mac OS - Mojave, this is setup as if it were a new MacBook when you turn it on. Macbook Pro 2011, upgraded to 8GB of RAM. Device will be wiped and ready for set-up on High Sierra. This is the more powerful model with upgraded i7 processor. 2.8GHz Core i7. MacBook Pro. In the event of a problem I will do my best to resolve it. The laptop has been tested and works as expected. OS Mojave FRESH install is on the machine. There are a couple of very slight dents to the lid of the machine. There is a dent to the corner of the lid of the machine. The battery still works but do not expect strong performance without replacing. Macbook Pro 2011 - upgraded to 8GB RAM. The MacBook is in excellent condition with just very very very minor age related marks which are hardly noticeable. The MacBook looks wonderful with the new screen and the new battery gives it many years of life. MacBook Pro 15-inch Mid 2012 A1286 2.3Ghz Quad Core i7 16GB. Optical drive has been removed and replaced with a 2.5” drive caddy. Currently laptop has 2x120gb ssd striped into a single drive. Not the best cosmetically, has a few dink’s and scratches and the rubber seal around the screen is a bit tatty. Missing a screw underneath. The 3 pin plug bit on the power supply broke so it has just been replaced by an ordinary power cable. That’s the bad stuff over with. Everything works as it should.It’s still a very capable laptop despite not being the newest tech. I put the removed optical drive into an external usb enclosure which I will include if it turns up before the auction ends. Any questions please ask. LOADS OF EXTRAS! 2 YEAR WARRANTY! MS - OFFICE 2019! Condition with scratches marks and dents as pictured. Main marks on top lid and corners. This macbook is part of a corporate upgrade program so is in good condition. MacBook Pro. Upgrade to 8gb ram £35. Condition with scratches marks and dents as pictured. Main marks on top lid and corners. The "E" key has a mark on it. MacBook Pro. Upgrade to 16gb ram £75. Upgrade to 8gb ram £35. Upgrade to 1TB £35. Storage : 256GB SSD. Condition Battery : 581 Cycles. RAM : 16 GB. (92 cycle count). Machine runs perfectly. Macbook Pro 2012 - In excellent overall condition with only minor scratching on the lid and bottom. Slight mark to the side of touchpad. Reset and ready for a new user. Slight strobe-light effect to display. Hard Drive Capacity: 120GB SSD FAST! Make: Apple MACBOOK PRO. FAST Great Macbook Pro. Battery Gets around 3 Hours Great Battery Life Cycle Count 104! Super Drive: Yes, integrated. Battery: Great Life 2 Hours or more. Developed by the technology giant Apple, the MacBook Pro is a superbly well-rounded machine. Great for taking to and from work everyday or as a study companion for a student, the Apple MacBook Pro uses the intuitive and easy to learn macOS. Each year sees a new iteration of the timeless Apple design, meaning there’s a variety of different models available, either new or used. In a crisp silver design, the newer 2015 MacBook Pro 13 inch models boast 3GHz Intel Dual Core i5 5th Gen processor for lightning fast speed. The 128GB hard drive of capacity has enough space for all of your favourite movies and songs whilst the 8GB RAM ensures a strong performance when using multiple programmes. The 12 hours of battery times give you ample time to work, study or watch on the go. MacBook Pro Retina technology allows for an incredibly colourful, bright and defined display, letting you stream your favourite shows in more detail than ever. The two Thunderbolt and single HDMI ports allow you to sync up two displays with your Apple MacBook, perfect for giving presentations. The integrated camera lets you FaceTime anyone with a compatible Apple device and the Bluetooth functionality lets you connect with other compatible devices. Although slightly older, MacBook Pro 2013 models come with 128GB of hard drive capacity and 4GB of RAM, which is more than enough power for using at work or at home. The 13.3 inch Retina display outputs unbelievable visuals. The backlit keyboard allows for typing in the dimmest of conditions and the built-in camera allows for video calling. If you’re after an older and less expensive model, the Apple MacBook Pro 2012 may be right for you. With 2.5GHz of processor speed, a 500GB SSD capacity and 8GB of memory, these models are still more than capable of handling their own - great for students who need a mix of value and performance.